Bring the little ones for an interactive adventure at an exotic animal kingdom. See giant anteaters, orangutans, red pandas, giraffes, African lions, black headed spider monkeys and countless other rare and endangered animals. Explore the popular Reptile Building, which houses turtles, snakes, frogs and lizards. Watch young eyes widen at fascinating educational programs, designed to inform and entertain. 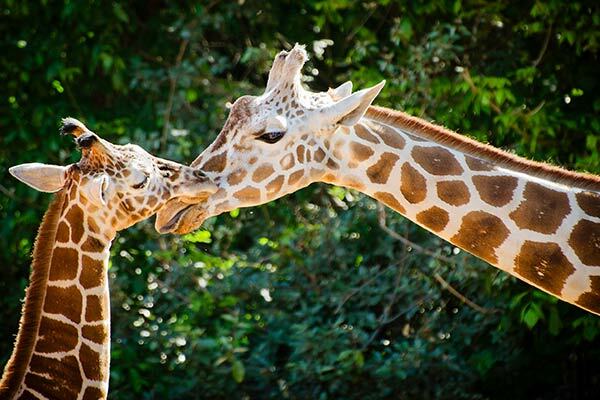 With hours of fun and discovery, Greenville Zoo is a great place to make lasting family memories. October 1 - February 28: 10 a.m. to 5:00 p.m.; March 1 - September 30: 9 a.m. to 5:00 p.m.
How much time does it take to tour the Zoo? It typically takes about one-and-a-half hours to tour every zoo attraction. That said, the zoo offers a number of interactive exhibits, educational programs and demonstrations which can take up extra time. For more information on these events and activities, call 864-467-4300. Can we bring food and drinks along? Guests are encouraged to bring food and drinks if they wish. The zoo provides a pair of covered picnic shelters, located across from the Education Building and besides the concession stand. Alcohol and glass containers are not allowed on zoo grounds.